2. In a bowl, beat together eggs, cream, flour, cinnamon, nutmeg and vanilla. 4. Bake in the oven at 350˚for 18-25 minutes or until light golden brown. Smaller, deeper pans may require additional bake time. Type of cinnamon rolls used can also vary cook time. Best to keep an eye on things and check one of the middle pieces to be sure dough is set before removing from oven. 5. When all dough is set, remove the french toast bake from oven. Warm icing from cinnamon rolls in microwave for 15 seconds; pour evenly over cinnamon roll pieces. Sprinkle with powdered sugar or top with maple syrup if desired. Serve warm. Enjoy! Think lazy weekend mornings or for serving overnight guests without a lot of fuss. This french toast bake is east and kid-friendly. It can even be made the night before then just popped in the oven to bake in the morning so it’s a great choice if you’re wondering what to make for Christmas morning breakfast. What makes this baked french toast recipe so easy? 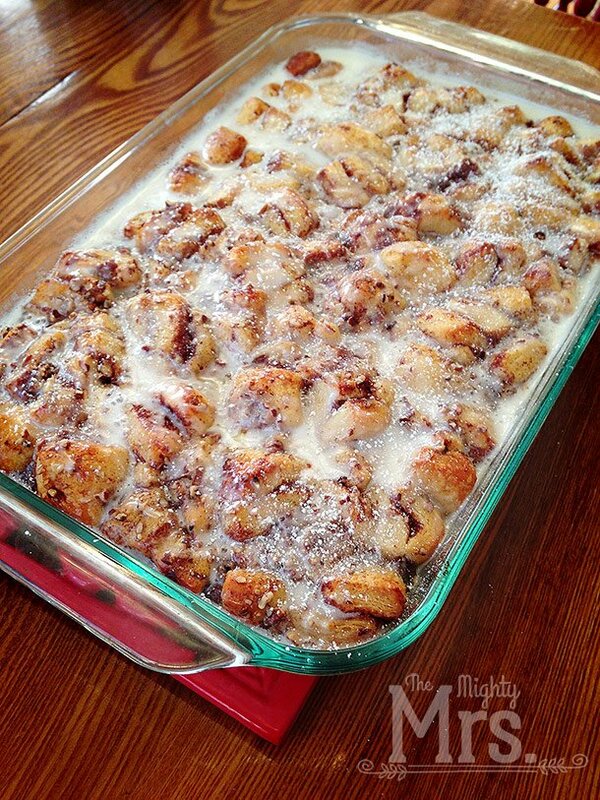 As I mentioned, this french toast casserole uses cinnamon roll dough instead of bread. Bread tends to get soggy when you add eggs and a creamy-cinnamon topping. The cinnamon roll dough however, holds up like a champ! In fact, think about what happens when you bake cinnamon rolls straight up, they get dry. So this is basically like the best of both worlds—a cross between cinnamon rolls and cinnamon french toast which results in a perfectly moist, sticky and a deliciously perfect breakfast treat. Nom! I actually discovered this recipe via a good friend who made this for us during a visit to her house years ago. It’s a variation of Pillsbury’s Cinnamon Baked French Toast recipe using canned Pillsbury Cinnamon Rolls. I was hooked after the first bite and was on a mission from there to make it myself and of course, add my own little touches. I did start with the original recipe by Pillsbury at first then experimented from there. The final version I landed on differs in that I added extra cinnamon, nutmeg, and flour; and reduced the eggs and cream so it didn’t get too soggy or overly eggy. The flour helps the egg stick to the cinnamon rolls, in case you get to that and you’re thinking about leaving it out. Just keep this in mind. Per my friend’s recommendation, I also left off the maple syrup because it’s plenty sweet enough without it. In my opinion. If you want to go all out and add it back, by all means, do it. If you just want a little hint of maple flavor, you could add a splash into the egg batter. I’ve seen variations of french toast bake this that also include pumpkin (perfect for fall! ), cream cheese and apples. So, have fun with this. Add sprinkles and make it into a birthday breakfast if you want. It’s really a very versatile and well-loved breakfast casserole. So my recipe below includes my tweaks after making and adjusting the ingredients many times over to get everything just right. It doesn’t have any of the extras nor does it need anything extra but once you master this base recipe, you can get as creative as you want. I actually even made this a slightly different way and came up with a version that’s more of a pull apart bread loaf if you want to try that here’s the recipe: Cinnamon Pull Apart Bread. This is easy but will it taste good? YES! This is one of the most popular recipes I’ve ever made and shared. I’ve been working on this recipe for a long time to make sure it’s absolutely perfectly delicious! This cinnamon french toast recipe has actually been pinned more than 170,000 times and has been “tried” on Pinterest with rave reviews so I’m pretty confident you’ll love it, too! Of course, I’m always open to improving so please let me know what you think and if you changed anything to make it even better. All feedback welcome! You can review the recipe below and/or leave a comment. Oven temperatures can vary greatly. For best results make sure your oven is calibrated to the correct temperature. Do this by using an oven thermometer and follow the directions for adjusting your oven temperature in your oven manufacture’s user manual. The size of your baking dish matters. This recipe calls for a 9×12 baking dish. This is important because it allows enough space for the pieces of dough to be spread out and cook evenly. If you are using a different shape or size baking pan, that will change the amount of time needed to cook and may not cook out evenly. The material of your baking dish matter. For best results, use a glass baking dish. Ceramic baking dishes can be very thick or thin so the cook time can very greatly. If you don’t have a glass baking dish, just check on the cinnamon roll dough piece and if it looks like they are not yet done, give them some additional bake time. Keep an eye on things. The dough can go from raw to cooked in just minutes and from perfectly golden brown to burned very quickly. If this is your first time making this recipe, it’s best to keep an eye on things especially towards the end of the cook time. Changing the ingredients may affect cook time and the taste. Using milk instead of half and half for example, may lengthen the cook time and sadly won’t taste as good but it’s a good way to cut fat if that’s what you want to do. If you make adjustments to the recipe, just keep an eye on things when cooking and allow yourself some extra time in case it needs longer to bake. Want some other food inspiration? I typically send out an email once a month with seasonal recipe ideas. The sign up box is at the bottom of this page. When you sign up, I’ll also send you a copy of the printable meal planner + grocery list I use. This cinnamon baked French toast recipe using Pillsbury cinnamon rolls was featured on Made by You Monday, Inspire Me Monday, South Your Mouth and Wow Me Wednesday! Glad you loved this. Great idea to add some brown sugar. YUM! This looks yummy and I’m making it for the first time for a bridal shower brunch. It says serves 6-8 people so is the pan nice and full? I want a big full batch so what should I do to serve more people without making 2 pans of it? Just double all ingredients and bake longer or would that be too much that it won’t fit into one pan? Kind of a dumb question but I want it to be a full pan to feed more people. Thank you. Good question. If you follow the recipe exactly as written and use a 9×12 dish, it will look just like the photo above. If you’re looking to double the recipe and you don’t want to use two 9×12 dishes, then your best bet would probably be a deep, disposable 10×14 foil pan. I’ve actually made this in a bread loaf pan before but the problem is you do have to bake it longer to get the middle cooked all the way and and then it comes out dry. So, keeping it shallow is best. If you use two 9×12 pans w/ lids (like these Pyrex ones), you could put one on the table, and keep the other one warm in an insulated casserole carrier (like this one), then swap out the dishes when the first one gets low. Yep, just 2 eggs. Pillsbury’s original recipe calls for more but I’ve found it comes out too eggy and soggy if you use more than 2 eggs. Can you use milk or half and half instead of heavy whipping cream? Hi Kerri, I haven’t tried to make it ahead but I think as long as you cover tightly to keep the egg coating moist, and refrigerate the cinnamon roll pieces it should be fine to bake it the next day. I would toss the pieces before you bake it in case the coating settles though. Enjoy! So so so good. Love this recipe. So easy and so yummy. Thanks for sharing! LOVE this recipe !! My son is a picky eater and doesn’t normal eat cinnamon rolls but he loved this ! It’s definitely a new Christmas tradition in our house ! Thank you ! Yay! Merry Christmas to you guys! Also wondering if anyone has prepared it the night before and just popped it in the oven the next morning. Please let me know. I like to do as much prep in advance if possible. Thanks!! It sounds delicious and I can’t wait to make it for our Christmas Eve brunch!! Hi Sandi! As long as you refrigerate this, it should hold up fine overnight. The only thing I’d suggest would be to give all those little pieces of coated cinnamon roll a toss in the morning before you pop it in the oven. Enjoy and Merry Christmas!! I did just that last night/this morning. It just needs a little extra bake time, since it’s going into the oven cold. Just slide a knife in the center to make sure it’s not gooey when you take it out of the oven. Delicious! Thanks for the tip about adding time when going in cold. Glad you enjoyed! When you say slice into 8, what exactly does that mean. 8 skinny cinnamon roll slices or are you dissecting it like a pizza into 8th? Hi Roberta, You want to slice each cinnamon roll like a pizza so you end up with 8 chunks. Thanks for asking. This looks so good. I’m going to try it tomorrow and will be back with review. Thanks for sharing. The recipe calls for pecans…but the instructions don’t tell you where to use them! I just sprinkled them on top and it was pretty good! We made this for Christmas morning and it was excellent! The family just loved them and went back for seconds! Instructions are little vague. Use all melted butter? Pour all liquid contents into pan to bake? Baked 25 minutes still soggy, having to bake now an additional 20 minutes because of the liquid. Not good. Yes, use all the melted butter, there will be extra pooled at the bottom and that is OK.
You do use all of the egg yolk mixture. After coating the cinnamon roll pieces, you pour any remaining mixture over top. This year I baked half a batch for about 20 minutes uncovered and it turned out perfect. When doubled, it takes longer and so I do cover it until the end so the top doesn’t burn… but shouldn’t take 45 minutes. Did you thoroughly coat the pieces with the liquid? If not the liquid could have pool at the bottom causing the cook time to be longer. Could I make this tonight and pop in the oven in the morning? Wasn’t sure if it would get too soggy or what the end result would be if I did so. I have not tried to prep this the night before. It could work if you tightly sealed the container but I would still worry that the egg mixture might dry up a bit over night. I know I’m a little late here, so if you tried this method, let me know how it turned out! This is the second year in a row I am making this for Christmas morning. We love it! It’s a new family tradition. Thank you for the recipe. This is the first time that I have made this. All I have to say is……it is delicious. My husband loves it and has gone back for seconds. My five year old daughter really enjoyed it also. That’s awesome. I appreciate the feedback. I have a 5-year-old and a hubby who loves this too. My 3-year-old also loves it! It’s kind of rare to find a dish that we all like so I consider this one a winner in our house. Glad it was a hit in yours as well.